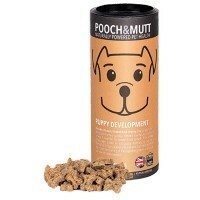 Pooch and Mutt Puppy Development Dog treats are low calory, gluten free treats that are perfect for growing puppies. Your puppy's brain develops extremely quickly and these delicious treats have been formulated with the ingredients needed to promote and encourage this growth. Chicken contains vital protein for healthy muscle and bone growth.